It’s the time of year again when members of the Anderson & Sheppard cutting room who go in with customers, who need to represent the firm by wearing A&S garments, have a stock suit made. Most of us get one a year. The longer-serving individuals have acquired a fair collection of suits, so they can afford to have things made that are specific to a season and range the weights in their wardrobe. The younger guys need to go for something that will be wearable for most of the year. So I’m going for an 11-ounce flannel, while senior trouser cutter John Malone is having a 15-ounce navy fresco made. Both are A&S stock cloths. 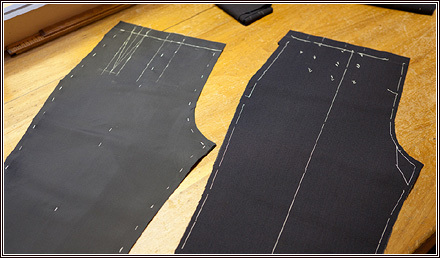 One of our regular trouser makers is making up the first pair, but he has now decided to have a second pair to increase the longevity of the suit – and has asked me to make them up. It’s a tradition at the company that the senior cutters, and to an extent the owners, have a tailor make up something for them before they are allowed to make anything for a customer. Just so they can check that the quality and fit is good enough. This is the first pair I am making for another member of staff. I’m quite looking forward to it. The fresco is a lovely weight and quite an open-weave cloth. The open weave means that you need to consider fusing some parts of it so that nothing frays, such as the pocket facings. They will be fused and serged (overlocked) to give them some more strength. Obviously the linen is still there, but it can do with a little more support.